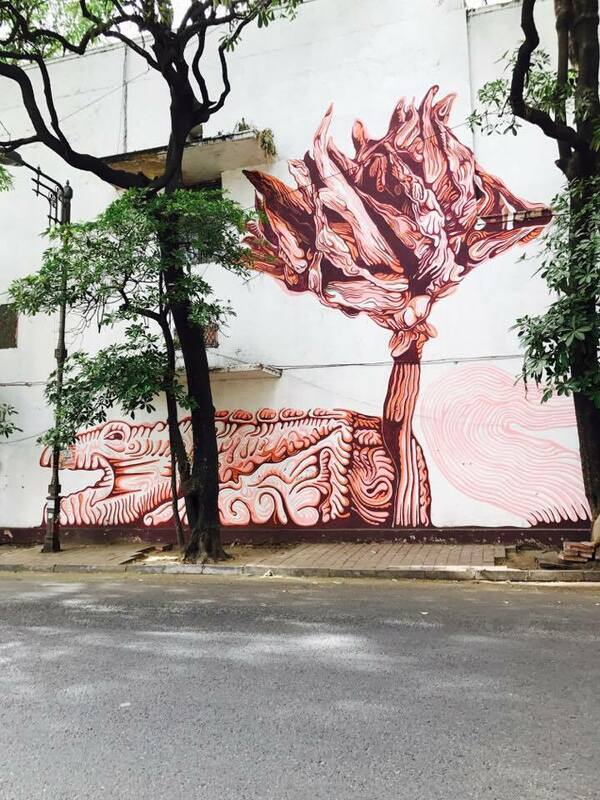 We recently went for a walk in the Lodhi Art District and the artwork from so many artists blew our minds. 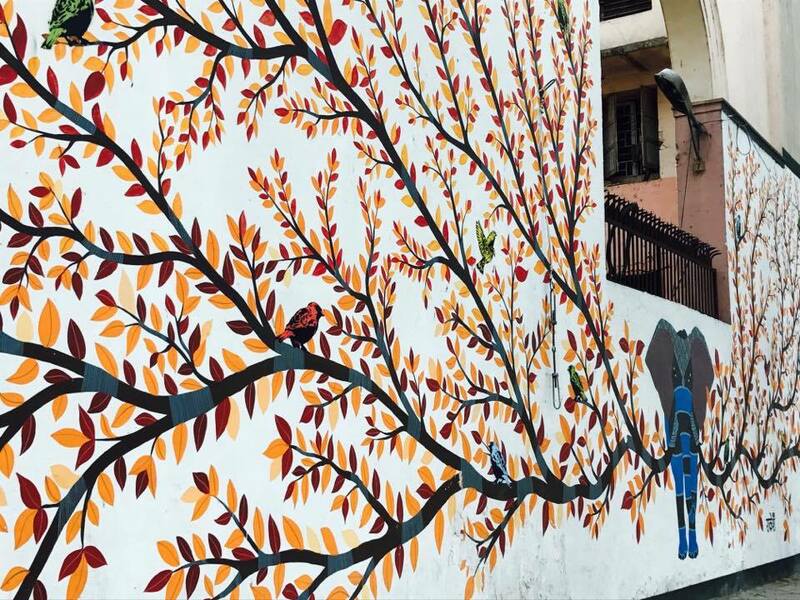 These paintings were painted for an art festival last year by the St+art India Foundation that aims to make our streets more interactive through the medium of urban art festivals across India. “Colous of the Soul” By Senkoe to represent the colourful diversity of people in Delhi and also to encourage them to communicate and share stories with each other like birds would. 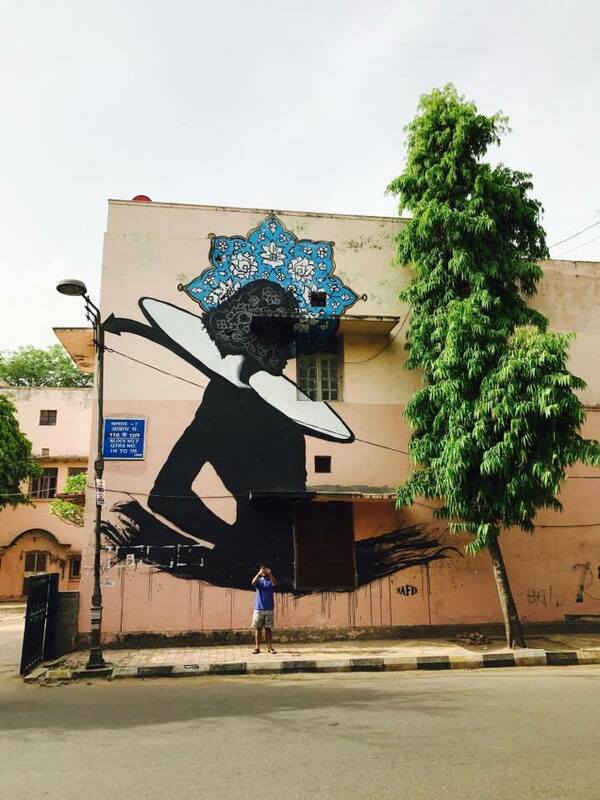 Inspired by a smbolic hand gesture from India that depicts a lotus and Khmer patters from Cambodia, Chifumi gave Delhi a cross cultural mural. The astronaut atop the wall is a metaphor for someone who can see things from a different perspective, as a silent viewer of a larger picture. In this case, he is a witness to all the daily activities of Lodhi Colony. Vishvaroopa by Inkbrushnme is an all-encompassing omni-form of lord Vishnu and marks the beginning of 18 day battle of Mahabharata. Vishnu manifests in his cosmic grandeur hypnotising Arjuna, the supreme warrior, and shows him that all universal matter, animate and inanimate, is him. Located at Block 7, Lodhi Colony, opposite Republic of Chicken in Meherchand Market. Niels Shoe Meulman did something he has never done before-paint a poem written by him. Being a writer for 35 years, he decided to mix-up all the influences he has had over the years to create this piece. Don’t let this Symboism Kill your heart by NAFIR: Raising a voice against the subjugation of women in India and Iran through his mural. Drawing inspiration from the festival of Holi, the playful nature of Delhi and the children who play cricket around this site everyday, Lek and Sowat decided to write the text ‘We Love Delhi’ in Hindi which Hanif then painted on top of their sanskrit cyphers to create an artwork which everyone in the neighbourhood could relate to and enjoy. We think it is such a wonderful Idea to choose these dull walls as your canvas and turn it into something so beautiful and also, the idea of an open Art exhibit that makes the art easily available to everyone. To pick a favorite wall is difficult… the birds Colours of the Soul and the free-falling camera guy would be my first two picks. I appreciate the descriptions you added. Wall painting should happen EVERYWHERE! Thank you for sharing this unique and inspiring post..
And thank you for finding and following me…I will gladly reciprocate.